So despite my bemoaning of the corporate tax laws on my “gifted” day off by my employer, I did have a pretty decent three-day weekend. Friday all of the kids were off doing their own things so the wife and I got to hang out, eat pizza, spin records, and drink. I enjoyed a New Holland Brewery’s Dragon’s Milk(Bourbon Barrel Stout), along with a couple Bell’s Brewery Kalamazoo Stouts. The wife had a strawberry daiquiri and a couple fruity rum drinks I threw together. I’d picked up Of Montreal’s Skeletal Lamping on vinyl the day before but hadn’t been able to spin it yet so Friday was my chance. Also, my pal John at Karma Records asked me if I’d take home a pristine-looking copy of Beastie Boys’ License To Ill to spin on my turntable as he was having problems with side two skipping for some reason. It played great on my turntable, and after a few beers I realized I needed to own it. Saturday was a lot of running around in the morning; including a stop at Karma Records for their anniversary sale. 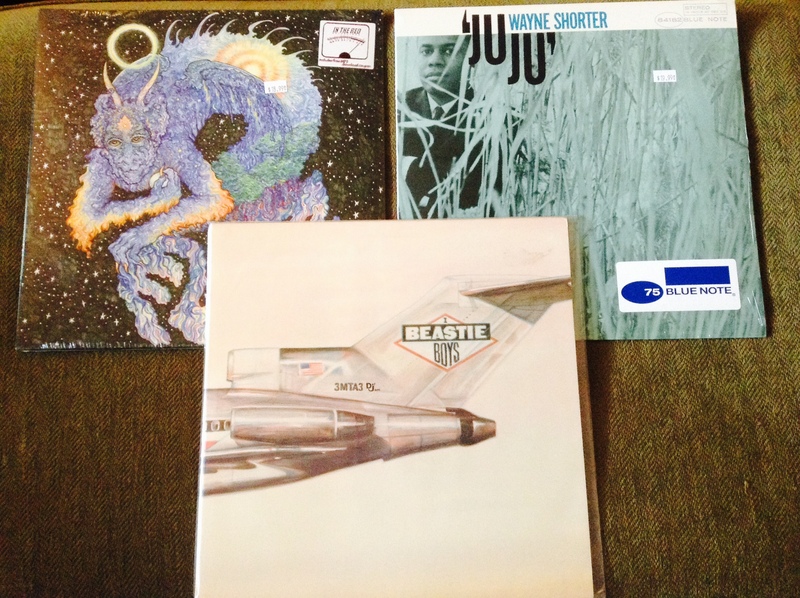 I snagged Wayne Shorter’s Juju and Fuzz’ self-titled. In the afternoon I took my two youngest to see Guardians of the Galaxy. What a great flick that was. Watching that reminded me of the wonder of cinema, at least through the eyes of being a kid. It had everything one needs to be completely entertained while also being moved. I look forward to what comes next for Starlord and Co. My oldest had some friends come over and stay Saturday night, so I grilled some chicken and we had chicken burritos with fresh salsa. It was pretty tasty. Honestly, I don’t even think I made it to 9:30pm before I was asleep in my chair. Sunday I cleaned up a pair of Bose 501 speakers I snagged from a guy at work(they sound fantastic, btw.) After that I sanded and stained some cabinets for my daughter’s soon-to-be closet space. In the afternoon we headed to my parent’s house for a barbecue, along with my brother and his family. It was good getting together and hanging out. Last night my wife and daughters headed into town to her aunt’s to see a cousin that was in town visiting. The boy and I opted out, instead staying home to watch UHF. It was a wise decision I think. Today? Well, I’m not sure what’s in store for today. Probably finish those cabinets, and maybe hook up mom and dad’s new DVD w/progressive scan I bought dad for his birthday. Eat something possibly. Write a review or two. I don’t know. There’s a chuck roast in the crock pot for beef and noodles tonight, so dinner is currently cooking. There was lots of labor this weekend, but at least it was the good kind. Oh ma you’re just jealous it’s the Beastie Boys! You ever try Innis and Gunn beer? Don’t know if you can find it your way, but it’s incredible. I’ve never tried it, but I’ll see if I can. Is it a Lager? Ale? Porter? All of the above? Ooh! Scottish ale. Love Scottish ale. I’m on a mission now! The Shorter Lp’s look yummy. Love that mid 60’s Blue Note label. Shorter’s work here is second to none, right after Coltrane on tenor during that time, imo. My favorite of those is Speak No Evil, Et Cetera and Adam’s Apple. Not to mention ESP, Nefertiti and Miles Smiles. Nothing can touch mid-60s Blue Note. Rudy Van Gelder made some of the best sounding albums that I’ve ever heard. There was never that much care put into making music as there was with those records. Just the sheer volume he recorded is astounding. Unheard of in today’s world. Not to mention the quality of the work. Very few duds in the whole history of the label. If you care to look any further for some prime Wayne, Lee Morgan’s 1965 Lp Search For the New Land. One of the most chilling pieces of free-bop recorded. UHf is a damn funny movie too. YOU SOO STOOOPID!!! Weird Al, Wayne some good stout sounds like a fine fine evening. I will most definitely look up ‘Search For The New Land’. Steely Dan’s “Aja” took on a whole new meaning once I’d discovered Wayne Shorter. The fact that these two dorky white boys from Long Island got a legend like Shorter to play on one of their songs…pretty amazing. Indeed it was a fine evening. The fact that my 9 year old son picked UHF as our evening viewing made it that much better.